While we posted about the Gears 0.4 features a lot of the press only really talked about the Geolocation piece. I think that is important, and posted on that too, but Brad’s piece discussed the full gamut including the Blob API, resummable HTTP, and Desktop API improvements to allow controlled file system access. The example that Brad built was the upload movie tool which ties this all together. // is this movie too large? 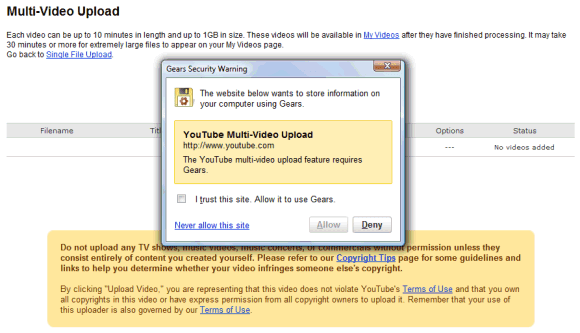 It turns out that YouTube has implemented a multifile upload using Gears which puts this into practice. As someone who uses YouTube a lot to upload files this is very welcome indeed, and I can’t wait to see more sites use it now the building blocks are there in a different way (can always use Flash / other controls in the past). Hmm, a free, open, probably highly accurate and often updated geolocation api that probably has decent response time. I think maxmind is going to lose some business eventually. Hi ck2, what browser are you using? Do you have Firebug installed? Take a look at the output there and tell me what message or exception you see. Sometimes the Geolocation API will return that it can’t find a location, especially if you are on a private Wifi network that has not been mapped.